The initiative has a simple background: research from Europe has shown that 40 per cent of charging would take place at the workplace. Ultimately, the aim is to encourage employees to make the change. The charging points are also connected to the cloud and integrated into NewMotion’s public charging network so that employees can not only use the charging facilities at their workplace but can also use the card to access all charging points in NewMotion’s European roaming network. JLR claims they source 100 per cent renewable energy for charging. With NewMotion, JLR has chosen an additional partner for its charging infrastructure. 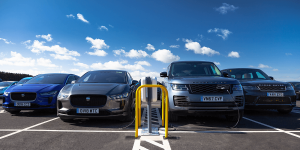 Just last summer, Jaguar Land Rover announced a cooperation with Plugsurfing to offer a premium charging service for their electric cars in select European markets.